We are very sad to announce the passing of our Dad, John Skelly. He died peacefully on June 8, 2018 at Marjorie Willoughby Snowden hospice at the age of 89. Predeceased by parents Jim and Eva, brothers Frank and Pat, sister Irene Wilson, daughter Marilynne, and wives Jeanne and Ann. He is survived by his children Jim (Lynn), Matt (Alison Slater) and Nevada (Jack Mendes) along with his grandchildren Christina, Jennifer, Julieanne, James, Brandyn, Taylor, Kianna, step-grandchildren Christopher Mendes and Alexander Mendes, and great grandsons Morgan, Ryker and Jackson. Born in Calgary on December 21, 1928, John moved with his parents Jim and Eva to Kamloops in 1939, on a parcel of property known as Jimeva Farms, now called Orchard’s Walk. John attended Kamloops High and spent a few years in the family business of farming with the Skelly Tomato Cannery before embarking in 1952 on a long radio broadcasting career. Ownership and management positions in radio stations took John and his family to Edmonton, Peace River, Fort St. John and Kamloops. John was the founder of Radio NL and served as President and GM from 1970 to 1982. John had his own radio show called Sunday Showcase which allowed him to indulge in his love of jazz, swing and big band music and play homage to his god, Frank Sinatra. 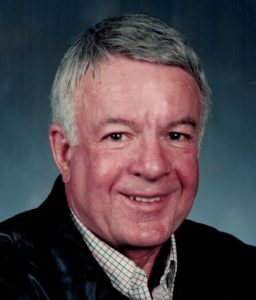 Before retirement in the late 90’s, John spent 8 years in real estate sales and served as an Alderman on the Kamloops City Council from 1984 to 1988. While on council, John was very proud to be an integral part of bringing Sunday shopping to Kamloops. John loved to fly and earned his private pilot`s license at a young age. One of his great pleasures was taking family and friends up in the air and flying to the Abbotsford Airshow for the day. Another one of John`s passions was boating on Shuswap Lake and showing his family the joys of life on the Shuswap. The family would like to thank the health care professionals at RIH for their care of Dad and Marjorie Willoughby Snowden Hospice for their exceptional care and emotional support during our Dad`s last days. Donations in John’s memory can be made to the Heart and Stroke Foundation, Marjorie Willoughby Snowden Hospice or to Diabetes Canada. John Skelly was a prince of a man, he was a solid businessman with a heart of gold, always caring for the people he worked with. He was a gentle-man. Water skiing behind his planing houseboat with a 1,000 foot rope was just one of many memories working and playing with John. John, I hope you are put in charge of the big radio station in the sky and that you beam down good vibrations to a world that clearly needs them. Goodbye, my friend. My heart was so sad to hear of your dad’s passing and the pain you are all enduring. Despite all that has transpired over the years, I have very special memories of your dad and your family. Your dad gave me my first note worthy job, as the front end receptionist for the weekends at Radio NL. I had the privilege of working with Wayne Cox, Claude Richmond and the rest of the “gang” in a relaxed, happy environment. I was so very proud to wear the Banner of Miss NL at local functions and activities. I will always dearly hold onto these and other memories. Your dad always treated everyone in a caring and respectful manner and you could tell he was well liked and appreciated by many.